Costa Rica is a playground for adventure, even though it is a small country, with an extension of 51 100 square kilometers, we have beautiful places and a quantity of activities to do; it means that while you were on a family holiday, you will not get bored. You can choose a lot of adventure tours or just soft activities, and we will give you some ideas to consider when planning your next family adventure vacation. We always have the opportunity to do different activities in every place of Costa Rica. If you are traveling with a group of friends, if you and your couple love adventure and adrenaline or even if you are an adventurous solo traveler, this is the opportunity you have been waiting to experience in a very different level. 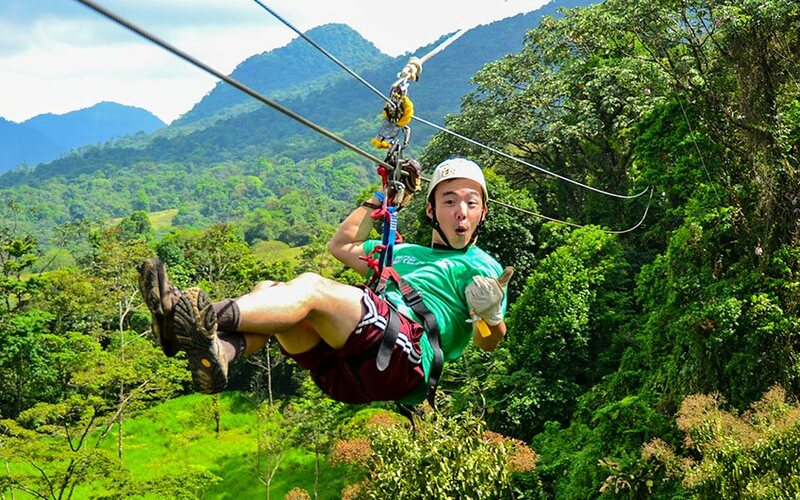 Here you will find a list of some awesome adventurous tours ideal for everyone; just take a look and remember that there is much more to do and there are no limits when you travel to Costa Rica. There is nothing like a recreation that will prepare you for the thrill of flying through the air some 15 meters off the forest floor. Family adventure holidays should include this activity that adjust to adults and children and does not require experience neither a physical effort, and it is an easy way to discover the forest from other perspective. While standing in the swaying canopy equipped with quality harnesses and safety lines, you can take a few minutes to enjoy a bird’s-eye view of the forest canopy. Bromeliads and epiphytes, as well as the abundance of birds, are a treat to see, especially from the top! As the activity is offered in different places and landscapes, you can experience the rain forest, dry forest or cloud forest, you will have the opportunity to see rivers, canyons, a volcano, lakes and much more while you are getting fun and releasing the stress. Additionally, we can say that the canopy tour is maybe the most popular activity for family trips as it is very safe; the Costa Rican companies offer good quality of security systems and the guides are prepared and very experienced too. You will be taken into a breathtaking scenery in what, among tourists, is a popular activity in Costa Rica. Whether you want to brave class IV rapids or paddle with the family along smoothly flowing waters, the variety of options are staggering. 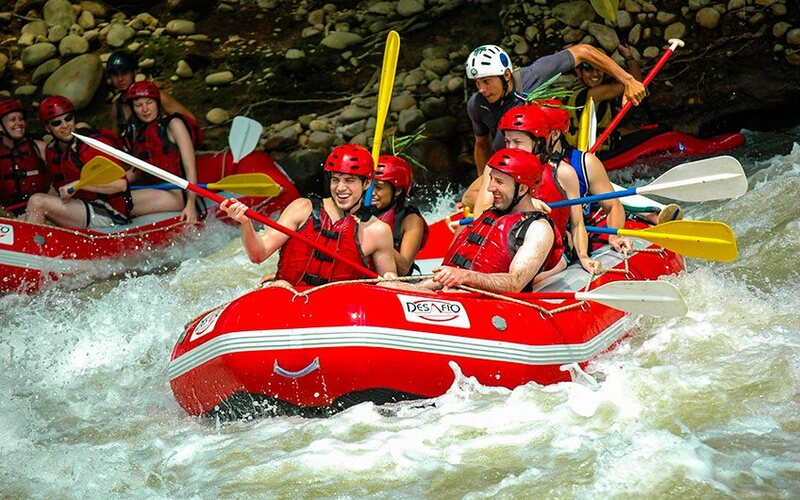 In essence every destination in Costa Rica offers rafting expeditions on a number of rivers. Nothing compares with braving the world-class rapids while traveling through some of the most beautiful forests in the world. This activity certainly requires more than what is needed for the canopy tour, for example, you should be in good shape, as you must be flexible and use your legs and arms hardly to paddle, this is a sport that requires physical effort, but it will depend on where you take it. During your family adventure, you will have the opportunity to choose different rivers along the country, the rivers are not available for all children ages, however, there are a lot of possibilities to discover, and the most important thing is to enjoy the activity. Offered up and down the Pacific and Caribbean coasts, sea kayaking is very popular. When the waves are rolling and easy, it add a great way to travel quietly to estuaries and mangroves for up close and personal viewing of wildlife. And when the waves begin to pound, it provides exhilarating sport for those with a penchant for wet fun. We recommend this activity for your family trip to Costa Rica because this is a soft adventure tour which does not require experience neither a strong physical effort, is almost available for all the ages. You can experience some kayaking on the sea which is very popular in some of our top beaches, but there is also a possibility of taking kayaking on rivers; nevertheless, it is important to mention that rivers are usually for experienced people, as they have a higher difficulty level. In the Tortuguero area, or in the South Pacific, kayaking in the mangroves is also possible, most of the lodges have kayaks for its guests, and it does not require a guide so you can easily take a kayak, a life jacket and a paddle to discover the surroundings on your own. 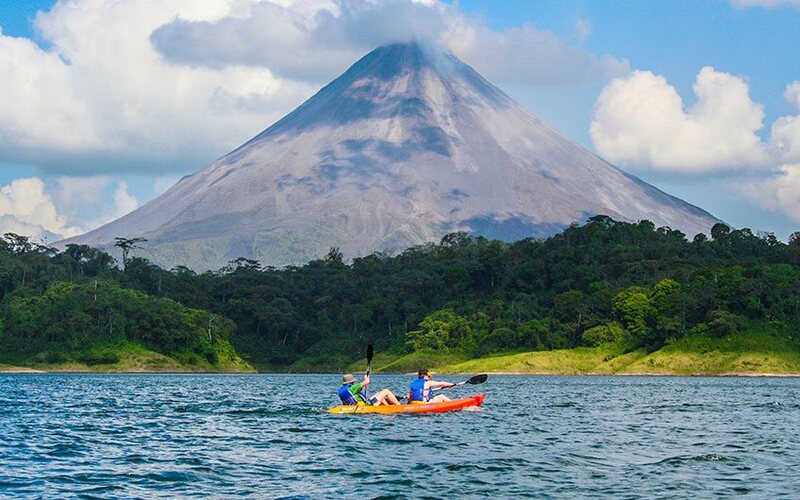 During your Costa Rica vacation you can do kayaking in the Arenal lake, and admire the view of the volcano which is just amazing. This is highly recommended if you are going to stay in the area and want to have a great view of the magical and astonishing volcano. 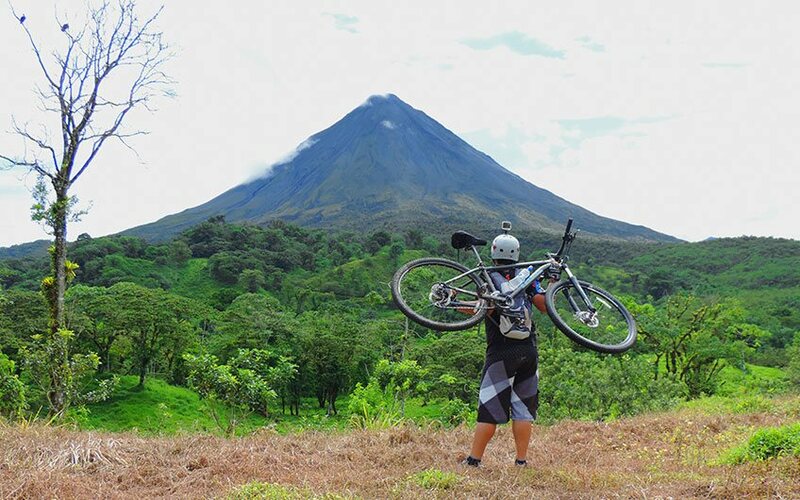 Aims to be one of the world’s accelerated growing sports, mountain biking in Costa Rica is gathering ground in popularity. It is practiced in a number of areas in the country but maybe better suited for the area of Tilarán. Local operators are currently extending their operations and have begun developing several biking routes for die-hard enthusiasts who want to sweat and work it when on their bikes. While there are routes that take as long as six-hours to complete, there are also more moderate paths for those less-experienced riders. This activity can be combined with cultural tours, as a very nice tour option to do. Family adventure can be full of adrenaline with biking in mountains, valleys or beautiful paths; it does not need experience but there are companies offering tours that can be longer and more challenging, it could take some hours. Travel Excellence can help you arranging a challenge biking tour during some days, for you to enjoy with your family. If you like to enjoy the experience of the adrenaline rush, these activities above are just perfect for you to have a lot of fun! Please leave us a comment if you liked this article, and contact us, whether you need more details of Costa Rica. Travel Excellence can offer you expert travel designers that will help you when planning your Costa Rica vacation packages.